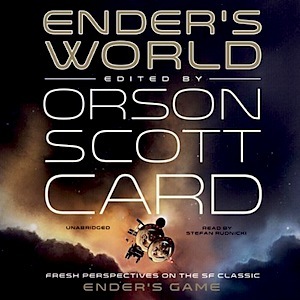 The original short story ENDER'S GAME by Orson Scott Card was expanded into a controversial novel that then became a chronology of before and after stories. Commentary on the entire Ender universe is in ENDER'S WORLD, narrated by Gabrielle de Cuir, Janis Jan, Arthur Morey, and Stefan Rudnicki. Technical questions are answered, and thoughts on how wars of the future may be fought in the future are covered. Ender Wiggin, in the award-winning SF story, is a boy whose tactical genius in computer simulation battle is exploited by adults facing an alien enemy, an insectoid race called the Formics. The "buggers" use the asteroid Eros as a base to attack, and, like real human wars in the Middle East, the battles never seem to end. Ender is enlisted to turn the tide, but is not told at first that the game he plays has real consequences. It is a fascinating examination of violence, morality, and compromise for survival. The audiobook is edited by Orson Scott Card, who also reads the introduction. The movie starred Harrison Ford.